Maybe you are thinking that it is too late to have a summer camp near Half Moon Bay. If you haven’t experience a camp before this is the time to let your child or the whole family enjoy one of summer’s best recreational activity. Most of the summer camp sites begin to become crowded so campers should plan ahead, especially during this season. Here are some useful tips to help you with summer camp planning and ensure you will be able to have a fun-filled summer. Schedule your camping trip. Temperatures in Half Moon Bay range from 60 degrees Fahrenheit in the summer to 40 degrees Fahrenheit in the winter; summertime often features morning and evening fog. Campgrounds get crowded in the summer and on weekends, so plan in advance to reserve a site. (http://www.traveltips.usatoday.com). Determine the Campground that suits you. Option 1. 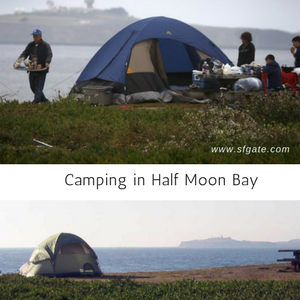 Book a site at Half Moon Bay State Beach if you are tent camping. This is the only place within Half Moon Bay proper that allows tent camping. Its 52 sites are available for tent campers. Since Half Moon Bay gets foggy and colder weather in the evening, dress in layers. Arrive at your tent site after the 2 p.m. check-in time (check-out is noon). Facilities: 52 campsites, 3 for tents only, others for RVs up to 40′ or tents, dump station, showers, amphitheater, Many sites now have electric hook-ups. Campsites: Maximum of 8 people per site, picnic tables, fire rings . For coastal hikers and cyclers, a Hike & Bike area is available for single night stays. Option 2: You can reserve a spot at Pillar Point RV Park for access to cable, water, electricity and wireless Internet. Pillar Point RV Park does not have tent camping. Check in to the Pillar Point RV Park from 2 p.m. to 8 p.m.
5 minute walk from beach, restrooms, showers, full hook-ups, cable TV, picnic tables, grills. Amenities: General store, picnic and BBQ areas, WiFi, bar & grill, spa available. Amenities: Volleyball and horseshoe pits, BBQ area, nearby pub, showers, bathrooms, laundry, WiFi hotspots, dump station. Full hook-ups, cable TV, picnic tables, fire pits, heated pool, kids’ room. (no tents). – Full hook-ups, cable TV, WiFi, Bathrooms with hot showers, borders the San Lorenzo River, clubhouse and recreation room. If you need a place to stay in Half Moon Bay during your summer camping, come and stay in Harbor View Inn. Located right across the street from the beautiful California Coast and close to many summer camp sites near Half Moon Bay. Enjoy the breath taking view of the Pacific Ocean near Pillars Point from every suite, comfortable single king, single queen and double queen rooms, a free continental breakfast each morning before you go out on your u-pick adventure, and more!